Other photos: Salon, Salon, Salon, Galley, Galley, Galley, Master Stateroom, Master Stateroom, Master Stateroom, Master Stateroom, Master Staeroom, Master Stateroom, Master Vanity, Safe, Master Head, VIP Stateroom, VIP Stateroom, VIP Stateroom, VIP Stateroom, VIP Head, VIP Head, VIP Shower, Bunkroom, Laundry, Windshield Screen, Helm, Helm, Helm, Helm, Helm, Cockpit Controls, Cockpit, Cockpit, Cockpit, Engine Hatch, Engine Room, Transmission, Sunroof, Antenna, Degrasse III Profile, Starboard Profile, Starboard Profile, Trunk, Photo 44, Transom. This Vessel Has Brand New Engines and Pods Installed in 2017!! FIVE Year Comprehensive VOLVO Penta Warranty on New Engines and PODS! 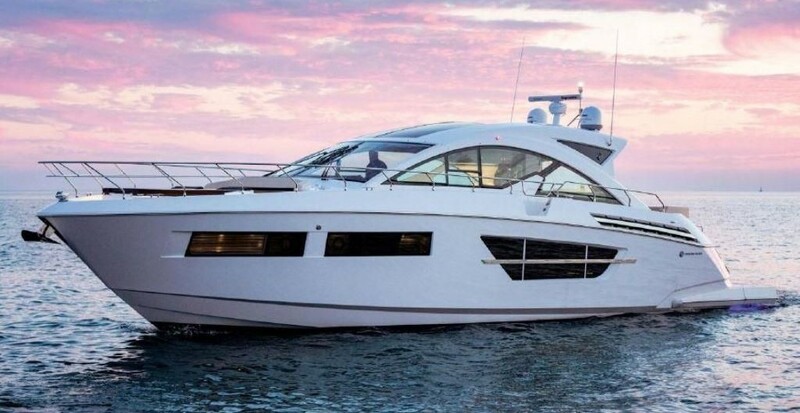 The De Grasse III is a C50 Maritimo Express, a stunning and innovative yacht that has great performance, efficiency, and all of the modern amenities boaters’ desire in an express cruiser. With her navy blue painted hull she is one of most beautiful boats on the local waters. With good looks come many additional upgrades and options like the full beam master stateroom, teak decking, an hydraulic swim platform, water maker, washer/dryer. Please see the section on recent upgrades and services!! This impressive design was one of the first express cruisers to have an enclosed helm (Stidd Admirals Chair) and salon with a galley aft, putting all of the social areas together and on one level; a design that many manufactures have copied. Please call to discuss or set an appointment to view this amazing boat!